Yesterday morning I was exchanging emails with another HubSpot top Partner. Let's call him "Steve". Steve is a HubSpot expert. He's in his late 30's and is super smart. Steve said he was tired of making everything custom and using Wordpress, and was checking out our HubSpot templates (and templates from two other companies). Steve had the EXACT same questions about templates that a person who just signed up for HubSpot had. Does that surprise you? Here's a webinar that covers a lot of those questions and has some pro tips. Steve and I have known each other for a couple of years. HubSpot notifiations were blowing up all over my screen showing him bouncing from page to page. I emailed him and said "Steve, you're all over the site, can I help you out?" We exchanged a couple of emails. He wasn't totally sure if he was going to buy our Briefcase template right away, if at all. But he needed help but was afraid to ask. I said "Steve, I don't care if you buy my template. I give away an awesome free HubSpot Template pack to 1,000's of people who never thanked me and who I don't expect to thank me. My feelings won't be hurt if you don't buy it." Here's the link to the free HubSpot Templates I'm talking about. Steve emailed me and said he'd call right away. 3 hours later he did. He wasn't in front of a computer so we couldn't do a screenshare. That would have been more helpful for him. He had a lot of questions about how things worked. It's a lot easier to show how to do things than talk about them. In 10 minutes you can see what I would have showed Steve in this video. I use just about every feature in HubSpot including the HubSpot Sales tool. An hour or so after my call with Steve, I'm sitting at my desk and notifications are blowing up on my computer that Steve is all over the site again. Clearly he didn't have all of his questions answered. Shortly after he hit all the pages, he emailed me and said I needed to explain it better on my site. I agree, and we are totally focused on being the #1 educator on HubSpot templates. I'm not sure if Steve signed up, but you can take our free course on using the HubSpot COS here. Explaining how Steve the Agency Executive thinks about templates is different than explaining it to a designer. If I explained a HubSpot refresh to a CEO the same way I explained it to a designer it would be totally different. Same goes for a Marketer who's a Wordpress Pro but is new to HubSpot. It's also different if you know how to use the HubSpot COS vs if you don't. Steve asked a lot of questions that matched up with the most frequent questions we get. I'll start with the BIGGEST QUESTION first! 1. How much can I customize the template? 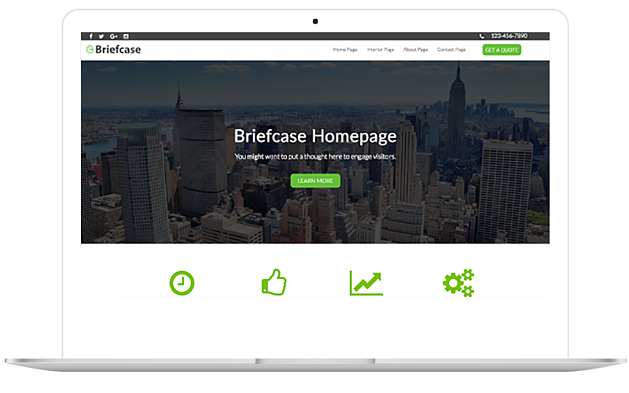 Briefcase is the number one template pack over 60 pages. Having trouble figuring out the options? You're not alone. This is what happens to everyone! The HubSpot Marketplace only allows us to show it in ONLY one version! Briefcase's colors that show on the HubSpot Marketplace are primarily black and green. So if your brand colors are black and green, you want it. You think it's the best one for you. If your colors are a few shades of blue you pass. Everyone thinks they need a developer to change this thing to match your brand! This is not true! You can make it HubSpot orange if you like! We've got instructions here for a novice on changing all the colors to anything you want. Our CSS sheet is super clean and we made a "For Dummies" section of it with documentation as a "cheat sheet". Plus you can preview a few color and style sets here! In addition all of our full pack purchases come with setup with a consultant who sets it up for you. You can watch the video here to see how easy this is! It's important to note that this DOES not mean that all Template providers do this! A company from Europe (I think) called Neambo has a HubSpot template called ACT template that you can use a configuration tool for. Some people like it, some don't. We chose to add our team to the pack instead of an automated builder. The automated thing is neat because you can see your changes, but I've got a list of sites made with these types of things and they all look the same to me. That's ok if no one sees another site like yours. Adding a member of our team in addition to having very easy to use CSS sheets with documentation has empowered teams to make very customized sites that look nothing like the orginal. Here's something that's a big deal too. Our team of consultants will clone all of your templates with your branding. So if you buy the full Briefcase pack, after you buy it and ask for a special customization. We'll transform the entire pack into over 60 templates that are no longer "Briefcase themed". They are themed exactly for your company! If you are an agency or work with one, please click here and I'll show you how to do this. We also bundle in more goodies every now and then and you can see what we have currently if you go here! 2. What happens after I buy the template? You already get the setup for the full pack. If not, you get this documentation. Plus you can add extra time with our team if you need some help on a smaller pack or an individual template. Will I need you for ongoing support? Most people don't come back to us after they are up and running. I'm amazed by that. I think it's because of the quality control from the HubSpot Marketplace team. And it's also because our team is made up of truly nice and concerned people. I know that's cheesy, but there's this thing called a culture code and our team isn't a bunch of super introverted coders. We thrive on working with people. What do I do if I want some customization that's advanced? Every situation is different! So if you want to have a highly customized site no problem. You can get an awesome outcome by making a hybrid of a template and custom pages starting at $2,000 plus the pack. And we also offer this plus migration starting at $4,000 plus the pack. Others pay $15,000 - $25,000 for the same outcome. What if I have my own designers? Perfect! We love designing. But we also love working with other designers too. If you have a designer that doesn't know HubSpot code we'll work with them and get their beautiful work and bring it to life in a template for you to use over and over again! Do you help me increase my conversions? Yes! Have you heard about Growth Driven Design? If not, here's an overview. It was started by my friend Luke Summerfield and a lot of other solid agencies. He's a genius, so if you're new to this stuff his way can be a little complicated. A lot of people charge retainers for Growth Driven Design. Agencies charge anywhere from $50K to $400K per year for this! With the right agency and based on your needs this could still be a great move. But what if you're not there yet? We don't believe in annual retainers and we have our own "Data Driven Design" program. We give you a coach and strategist and tons of analytical tools. We figured out how to help you. You shouldn't have to "wait and see" for six months while you are paying a retainer that "may or may not work". The data is there already on your site, to prove out what you're ROI is. Our rule here is NO GUESSING! Our program details are here and don't go overboard with someone else until you see our pricing and how we do it. We are also offering self guided training which you can sign up for here. 3. How do I choose a plan and a template? I know everyone hates the idea of "talking to a person". We do have a bot and all of this documentation. However, you can get a consult with a screenshare. It's 15 minutes. No pitch, no upsell! If I was trying to upsell you, I'd never have given this FREE pack away. It took a long time to make and it also competes with our Paid templates, it's so good! You've got a few choices on a consult. If you're a business owner and don't mind someone who's a little direct, you can book a 15 minute time slot with me here. Matt is also here to help you and his calendar is here. He's really technical and extremely patient. We've got a lot of other great team members who thrive on sharing. Just hit our chat window. If you aren't ready for a consult and still just planning this this might be your answer. It's an estimator tool we use to assess your planning and give you a budget. It's not 100% automatic. But you aren't going to get a call unless you want one. This tool will point out what your missing in your planning process as well. It's a big time saver. If you're super squeamish and can't even handle an email from someone, you can just download this ungated checklist. Remember... if you struggle with figuring all these things out, it's not your fault. Even a Platinum Partner like Steve has similar questions and wastes a lot of time figuring it out on his own. Want to learn more about the science of design? Subscribe! HubSpot Website Refresh for $995! How Will You Assess Our Business Needs? How Will the Website Help Us Meet Our Goals? How Will the Site Perform? How Search-Engine-Friendly Will the Site Be? What Are the Details of the Design/Development Process? How Transparent Is the Development Process? Who Will Do The Design and Development Work? Do you Start Your Design and Construction from Scratch? How Mobile-Friendly Is the Design? How Do You Deal With Client Feedback? How Will Content Be Developed? Can You Show Me Your Previous Work? How Easy Will It Be to Update the Site After The Project is Done?